My parents never let me play with Barbies when I was growing up. They were feminists, and didn’t approve of the strict gender stereotypes enforced by them. My brother, however, was bought two. One, a Pocahontas doll. One, a black athlete (on a side note, I just searched on eBay to see if I could find the exact model my brother had. ‘Black Barbie doll’ returns just 4 listings, whilst ‘Barbie doll’ gets you 763. Oh, and searching for an athletic Barbie brings up mostly cheerleaders). Mattel has produced a new advert, with the tag line “What happens when girls are free to imagine they can be anything?”. I’ll give it this, it’s cute. Young girls are shown taking on a range of professions: lecturer; vet; tour guide; football coach and business woman. They interact with bemused adults, who find the girls funny and cute – they don’t quite fit in, but one day, they might. Then we’re shown that all along, the girls were playing out the scenario with their Barbie dolls, dreaming of a future career with the aid of their plastic props. And of course, the internet is awash with praise for Mattel. Cosmopolitan see it as “empowering”, Quartz declare that Mattel has confronted “its feminism problem”. I think Mattel’s problem with feminism requires a slightly bigger fix. We could start with slightly bigger body proportions for Barbie dolls, whatever their career aspirations are. This latest advert does indeed reflect a step forward from Barbie dolls who came with weighing scales. But for me, whilst this is arguably progress on an individual level, it’s one more sign of a non-feminist company co-opting feminist ideals to sell their product more widely, whilst remaining essentially harmful (Megan Stodel wrote a great blog recently about ‘dilemma feminism’, and whether we should support small improvements when we oppose the larger institution, and this is one more example of that phenomenon). We shouldn’t criticise dolls for being dolls. Using dolls as play is indeed a great way to build imagination, and society is often too eager to condemn those activities associated with girls whilst encouraging those associated with boys. I spent hours absorbed with my Playmobil characters as a kid, dreaming up all sorts of storylines worthy of winning awards at the British Soap Awards (there were kidnappings and ransom requests, lovers who discovered that they were siblings separated at birth). Mattel are right that Barbies may be able to inspire children’s aspirations and ambitions. But the thing to remember here, is that how ever many professions a Barbie comes in, they’re still damaging to young girls. Why? Because there’s no point advertising them with a feminist jingle, while their body proportions are still so unrealistic. A little girl (or boy, but let’s remember that this ad doesn’t feature any – it’s clear who Mattel’s target audience are) might pick up a Barbie and imagine that she’s a business woman, but as long as she’s still absorbing the message that she has to have an unhealthy BMI to do so, that’s not progress. 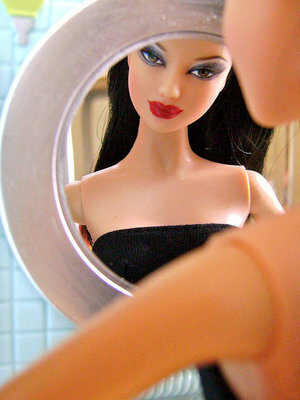 The body proportions of Barbie dolls aren’t only unhealthy, they’re frankly impossible. Some researchers have suggested they wouldn’t allow for menstruation, in a cis woman. Others have claimed that the size of her liver would mean Barbie would have to walk on all fours. So Mattel, great things can happen when girls are left to imagine they can be anything. But for as long as a girl plays with a Barbie doll and absorbs the unconscious message that she needs a 19-inch waist to attain her goals, Barbies continue to be limiting, not empowering.